In today’s context, it seems almost an extraordinary thing to trust another with our true feelings. Revealing our inner self to another makes us vulnerable. What will the other think of me? Will s/he laugh at my feelings? Will s/he brush them aside as if they don’t matter? Will s/he tell me I’m foolish to feel this way? These are just some of the questions that stop us from allowing ourselves to be vulnerable with another. In the last month or so, I’ve been struggling with feelings of inadequacy and malaise. José keeps asking me why I am not writing my Morning Pages or doing my creative journalling. I really have no answer. I’ve been telling him that I just feel low and can’t seem to find an explanation for this. I know the feelings will pass, so I’m not unduly worried about them. What I’m celebrating is the fact that I’m daring greatly to be vulnerable – vulnerable enough to share my feelings with José and know that he has a safe pair of hands to catch me. Yes, I’m daring to be vulnerable. Believe me, for someone like me, who was a master of the cover up, this is a huge step. For the most part of my life, I went about as if everything in my world was perfect. And people were happy to believe that. If I ever said that I wasn’t feeling okay, it would make others uncomfortable. How could Little Miss Sunshine who hid behind that fabulous smile ever be not okay? But I was far from okay. And too scared to talk about it to others. This was, in part, because the root of my unhappiness was not (or so I thought) my story to tell. So I kept things completely to myself and hid my feelings behind a smile. The only emotion I allowed myself was anger – that too only at home. I was that friend who was always around to listen and understand. I soaked in the pain of others. I compared my feelings of pain with those of others, and it always seemed that their pain was more than mine. My problems seemed insignificant, or so I taught myself to believe. I longed to be understood and to be loved by that one special person. As a result, I invested a lot of myself in a series of ‘relationships’ in which I tried too hard to love in return for being loved. I now realize that quite apart from the fact that these guys were a bunch of frogs, the fact that I was always the emotionally strong one didn’t make for a good match. It was when I realized that I had first to learn to love myself, that things began to change. Ever so slowly. It has taken a lot of inner work and the love and understanding of a husband who saw me for who I am much before I saw myself, to be where I am today. Now I dare to be vulnerable, just as I dare to be strong. In fact, from owning my vulnerability came a lot of inner courage and resolve. I now dare to speak from my heart, even at the risk of being unpopular. There have been times in the past few years, that I’ve dared to be vulnerable with people I thought were friends, only to have them turn this around to their advantage. But that’s part of the journey. I’m not done yet. There are several areas of my life that need to be spoken of and dealt with – wrong choices I still carry guilt for, and hurt feelings I have to come to terms with. Perhaps these past few days have been indicators of that – a call to grow, to dare, to be even more vulnerable and most of all to be more authentic. On the eve of my 50th birthday, I celebrate my ability to be ‘cor’ageous. I promise myself that I will work on letting the light in to those feelings that I’m too afraid to share and pledge to continue speaking from my heart! Happy Birthday–Xronia polla kai kala (many good years in Greek)! I think we’re also vulnerable and courageous when we blog, comment, and share our feelings. Funny, it sounds so easy when you write it out. Thank you for the clarity. Beautiful post, interesting when you mentioned that when you spoke about not being ok it made others uncomfortable. I always run into this problem and never really know why people get upset that I express my self and now I get that it means they might have to become vulnerable as well…great post. Great post..It takes lot of courage to be vulnerable, but yes, it’s not impossible. 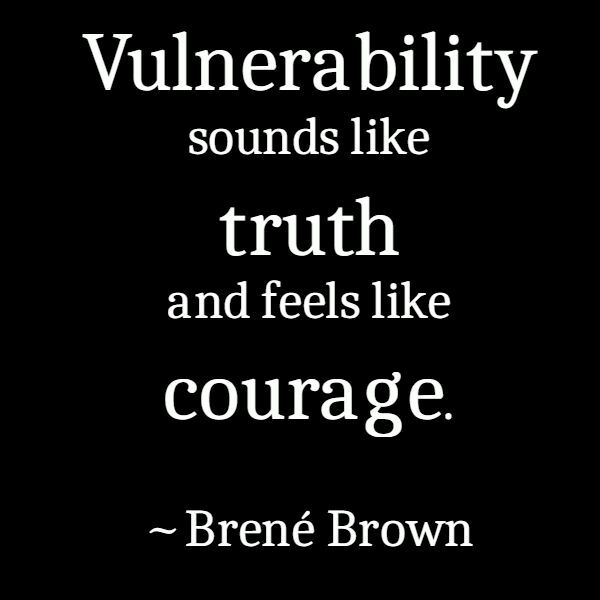 While I admire your courage in admitting your vulnerability, I do hope you continue to speak from your heart. I also hope you had a great birthday and welcome to the gang of the Golden Girls. It takes a lot of courage to be vulnerable indeed…And yes there will be time when people take advantage of that but we shouldn’t change or stop…I have been guilty of hiding that vulnerability because I have been hurt by people, friends who I thought were genuine…Now there are only a handful of people who can see me at my lowest , I’m very fierce about protecting myself from hurt that I have perhaps formed a wall around me..I don’t let people into my inner circle anymore… I guess I should give it a shot again? It will be hard I know but it could be worth it too..
Great post! Well done for opening yourself up – not easy even with friends. Authenticity is best but it’s a painful journey. Yes, it’s totally worth the pain though. Thanks very much, Shan.